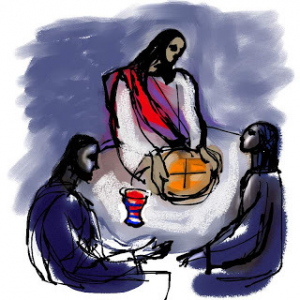 Here are some worship suggestions for Luke 24:13-32, where two disciples encounter the risen Christ on the road to Emmaus. and renew our strength as we continue to walk and commune with you. the grace you have shared with us so freely. ~ written by Rev. Frank Schaefer, and posted on the Desperate Preacher website. Risen One, like those disciples on the road to Emmaus, we struggle to recognize you in the everyday journey of our lives. We seek your wisdom in the midst of the questions we have about the circumstances we find ourselves in—circumstances sometimes beyond our control, but often of our own making. Open our eyes, Light of the World, to your work of transformation in and around us. As we walk with you day by day, may your new life be made manifest in what we say to others. Help us to understand the power of our words to hurt or to heal; give us the graciousness to make all our conversations holy. Just as we desire that our speaking be holy, may our seeing be holy as well. We are bombarded with images everyday O Christ, that shape our attitudes and behaviors. As you opened the scriptures to the disciples and taught them everything, open our eyes to behold you in your Word, in the beauty of nature, the beauty of another human being and the beauty of sacred art. And in our seeing, help us to recognize and welcome the stranger in our midst. May our welcome be a celebration of the gifts and graces of persons who are different from us and not merely some token tolerance of an outsider. You were known to the disciples in the breaking of the bread. May your resurrection presence guide us in the decisions we make about what we take into our bodies—especially what we eat and what we drink. Help us to understand our eating and drinking as sacred events, not to be abused or approached mindlessly. So often we forget, Holy One, that you invite us to abide with you; to have our lives hidden in you. We thank you that you travel with us in our joys and our concerns. ~ posted on the Church of Ireland website. One: Risen Lord Jesus, what is it that keeps us from recognizing you? Two: When we are so full of ourselves, it is all too easy to block you right out of our lives. One: Maybe it’s the way we interpret Scripture that obscures the signs pointing to you. Two: Perhaps we are guilty of being slow of heart when we don’t recognize you in our neighbour, or in the guise of the poor or the dispossessed. One: Our eyes and ears have become so crammed with the sights and sounds of living that we simply fail to see you or to recognize your voice. All: Risen Lord Jesus, help us to empty ourselves of all that hinders our awareness of your presence with us. Fill us with the joy of knowing your continuing presence, so that, like those travelers on the road to Emmaus, we too, hasten to share this great good news with others. ~ written by Moira Laidlaw, at the Liturgies Online website. Go now as witnesses of God’s eternal presence. ~ Copyright © 2002 Nathan Nettleton. Posted on Laughing Bird Liturgical Resources. on the brink of meaning. Meet us here, Jesus, Lord! how our hearts are burning! Walk with us, we urge you. our hearts need it daily. Stay with us, Jesus, Lord! stay with us, we urge you. It is true! The Saviour lives! Go with us, Jesus, Lord! Strengthen us, we pray you. send us with your Gospel. ~ Copyright © Brenton Prigge, 2005. CCLI license holders may freely use and reproduce these lyrics, provided that CCLI copyright protocol is followed. CCLI # 4494803. Posted on the New Hymn website. ~ Matt Redman. Copyright © 2004. Thankyou Music. CCLI Song # 4328869. ~ from the Hermano Leon Clipart website.